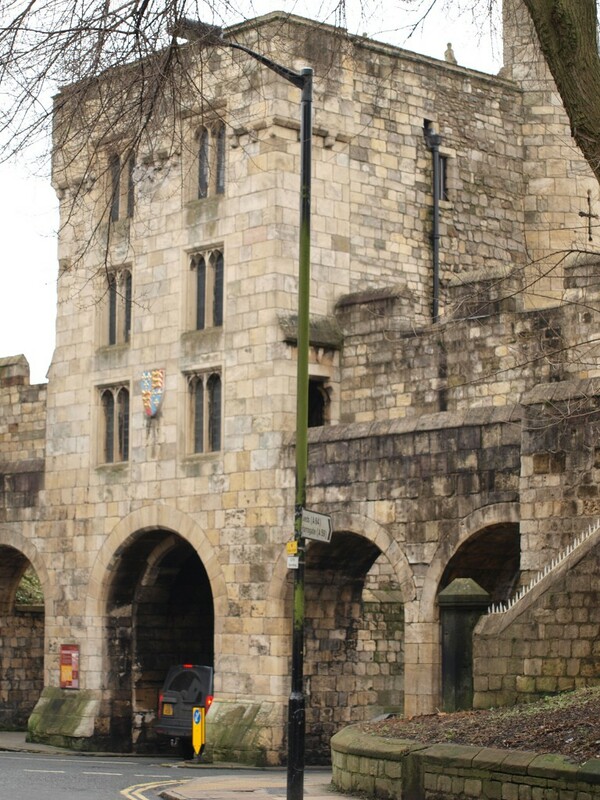 NOTE that during the summer of 2017 Micklegate Bar will be undergoing extensive repairs to the roof and other structural changes. 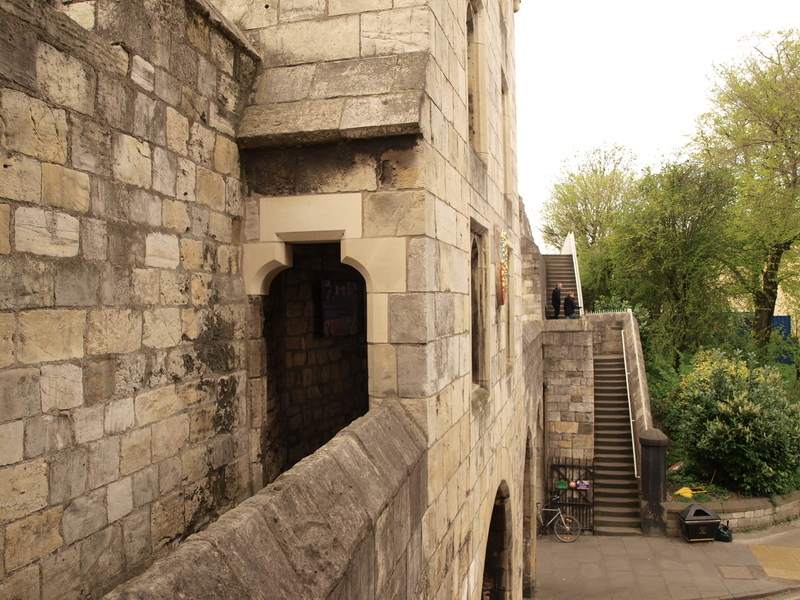 This work is being carried out by The City of York Council and will result in occasional walls walk and ground level closures or restrictions. The Bar will be obscured by scaffolding for the duration of the works. 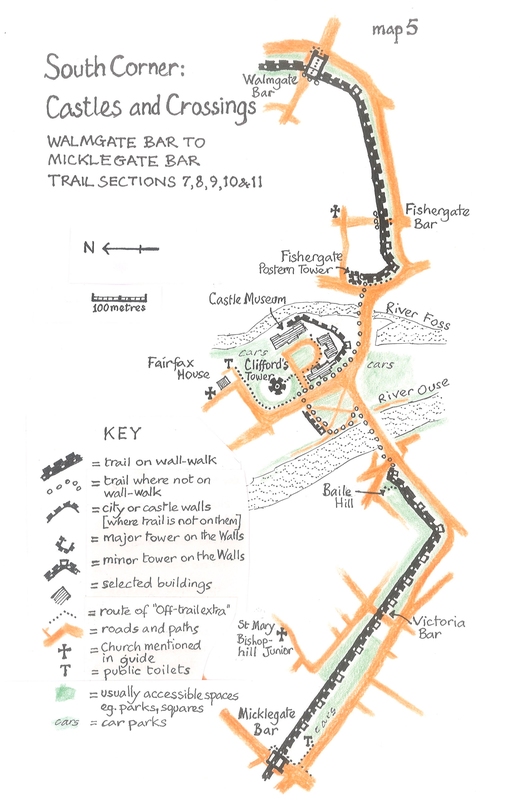 If you are really short of time and are doing the basic trail then stay on the wall-walk as it goes through this bar. 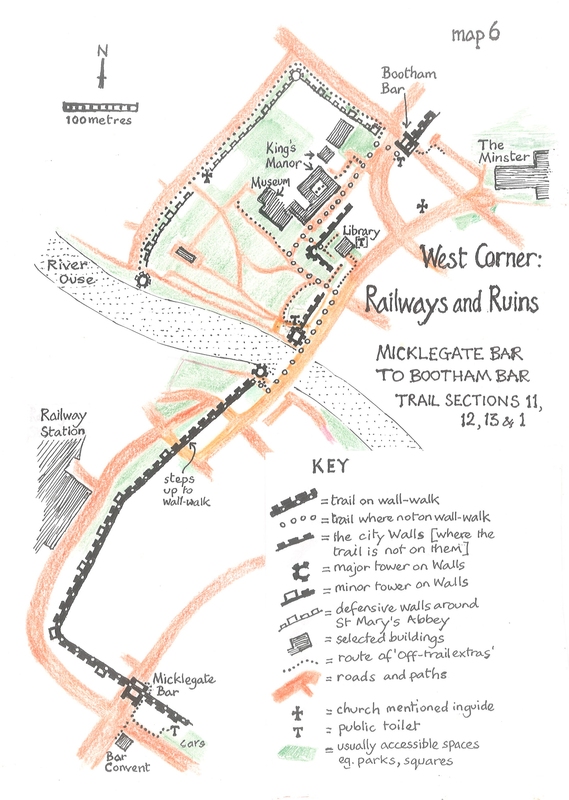 After all, you will have seen the front of Bootham Bar, the back of Walmgate Bar and some of the arched passages of Monk Bar and Walmgate Bar –but some would say that you will be missing most of the principal bar of York. This is called the principal bar because it guards the main road south, it’s the place where monarchs are greeted and it’s the main place where the heads of people these monarchs called traitors were shown off. Notice the modern stone figures on the battlements as you approach [and/or as you leave] the bar along the wall-walk –this is probably where the heads would have been spiked –the last ones were of supporters of Bonny Prince Charlie in 1745. He brought a Scots army further into England than York, scared York people into hurried repairs of the Walls but then retreated back to Scotland and defeat. In Royal greetings here the ceremony involves a loyal speech of welcome to the Monarch and the city’s sword-bearer’s presenting and reversing his ceremonial sword. It is said that King Richard II gave the city a sword from his side and permission to hold it upright, more than 600 years ago. 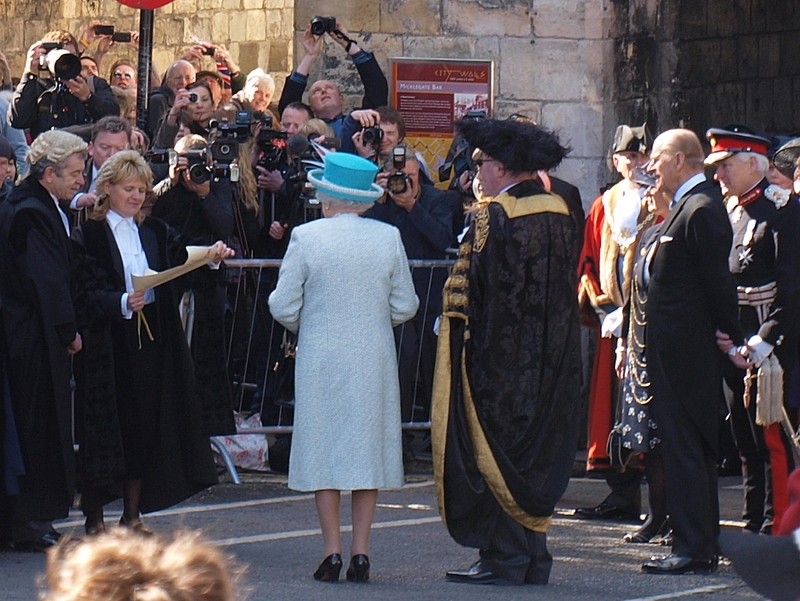 When James I was welcomed 400 years ago, he was politely offered the city’s sword [he took it then returned it]. When the present Queen is welcomed, the ceremony involves her being presented with the sword and touching it while she is on the outside of the bar. She only goes through the bar when she has symbolically confirmed that the sword belongs to the city. 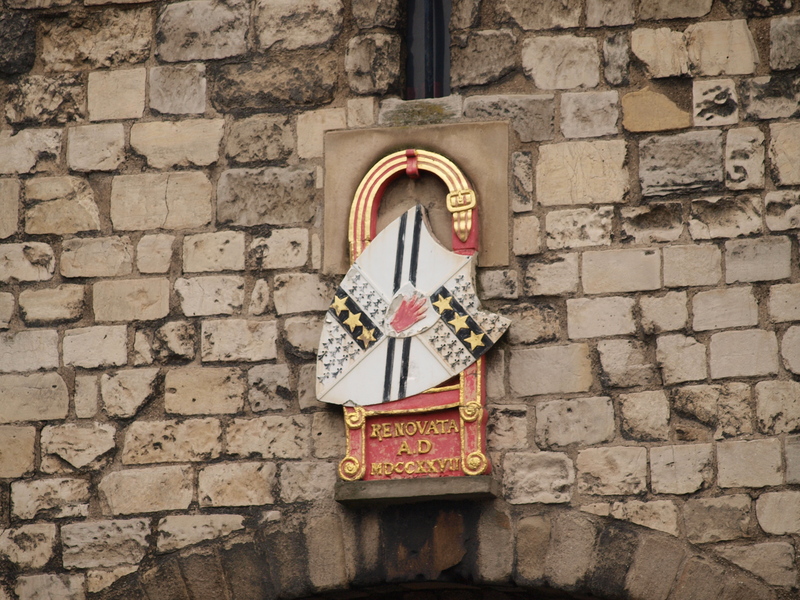 The sword stands for power in the city -monarchs have used many royal charters to give or sell some of their powers to the city since even before King John’s 1212 charter. In spite of its gift having been confirmed, the sword is courteously held point downwards when the monarch is actually in the city. Extras were sometimes added to the ceremony like music or mechanical displays that used the bar as a firm base for the levers and pulleys –and as something to hang scenery from. Henry VII seems to have been greeted by a crown descending from a heaven [pictured at the top of the bar] onto a red and a white rose while other flowers [at the bottom of the bar] bowed to the two roses. The figures on the battlements are modern replacements for ones mentioned as getting attention from craftsmen more than 400 years ago. The back of the bar is also relatively new  but the bar is basically a much-renewed 14th century building on top of a Norman archway with a room built above that archway around 1200. 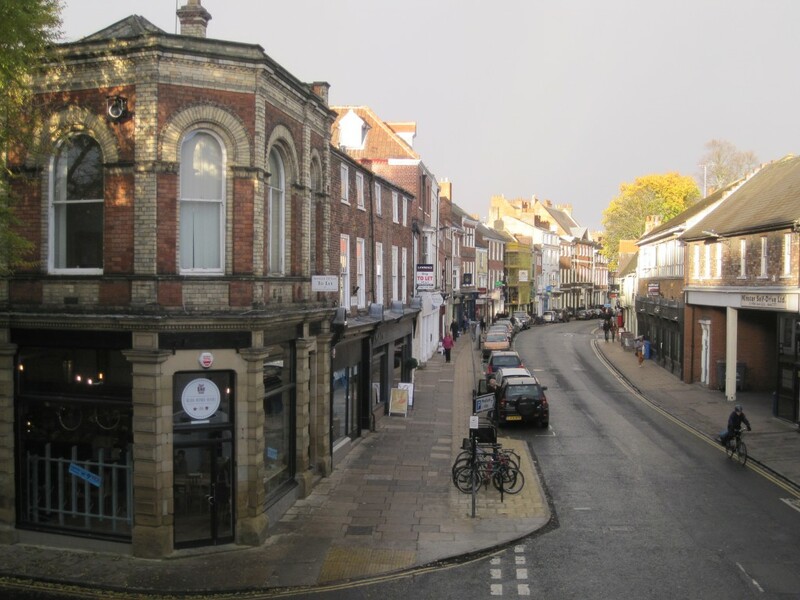 Some like the view into York, down Micklegate, the road that runs through this bar; this view is best seen from the wall-walk as it leaves the west edge of the bar. 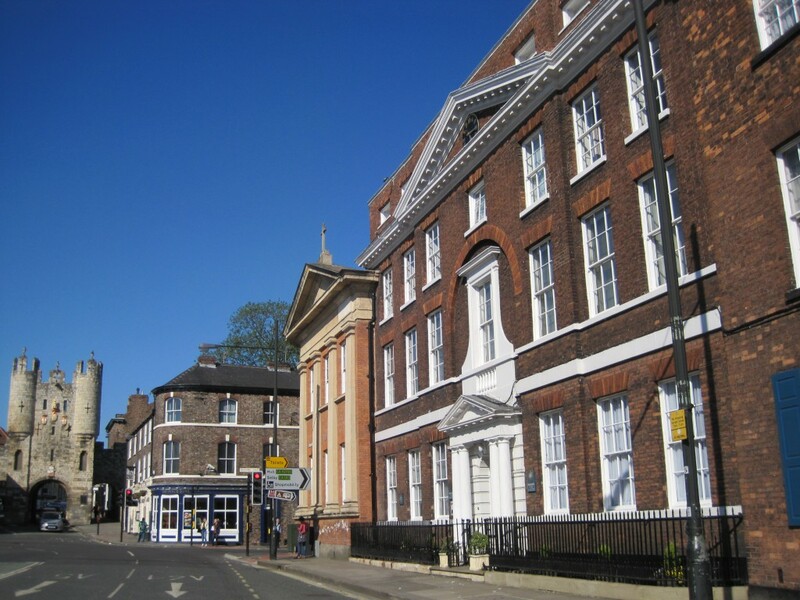 You can just see a large, typical Georgian building [Micklegate House] on the left side of the road before the road disappears round its gentle bend. Go outside the bar on the east side of the bar [if following the trail clockwise this means going down the first steps and turning left along the pavement], it is about 50 metres to the crossroads and then about another 50 metres left on the same pavement to the public toilets. They are in a car park that has been built where there was once the moat that went around the Walls. On your way back you see the bar as described in “Front of the bar” immediately below. Go outside the bar on the east side of the bar [if you are following the trail clockwise this means going down the first steps and turning left along the pavement]. After about 30 metres look back at the front of the bar. You’ll see numerous straight and cross shaped arrow slits in the bar. The two small, studded wood doors led to the wall-walk around a defensive barbican, this was built out from the front of the bar in medieval times to strengthen its defences and pulled down in late Georgian times [partly because some of it had fallen down]. Switching from defence to decoration, you’ll see a royal coat of arms and the city’s gold lions on a red cross. The lowest and most striking coat of arms is of the Lord Mayor responsible for an early restoration of the bar. Some details of the restorations [and of the old decorations that we fortunately lack!] are given on an information board on the right of the bar. The other, more modern, boards are on the other side of the bar on this side of the road through the bar, and on a wall by the pavement on the other side of the road –this wall also has the metal map for rubbing which features a child’s cheerfully ghoulish illustration of a spiked head. As you walk back to the bar, look at its arch and the low parts of the side of the passage immediately behind it –the arch is believed to date from Norman times and the passage is built with some re-used Roman stone including coarse sandstone coffins. A brass trail marker suggests you should also peer down this passage from the city-side of the bar –it would be dangerous to think this marker is suggesting that you go into the passage or cross the road at this point. It is better to go up the steps to the wall-walk on this side of the road. Go outside the bar on the east side of the bar [if you are following the trail clockwise this means going down the first steps and turning left along the pavement], go about 50 metres to the crossroads [the traffic lights have a light for pedestrians] and you’ll be facing the side of the Bar Convent; its café is through its main entrance, about 20 metres further on. The convent is a fine Georgian building which also houses the oldest Roman Catholic nunnery in England and a free museum. It has more substantial meals than many cafés, free leaflets and a shop. On your way back you see the bar as described in “Front of the bar” in the previous section. The small museum inside the bar is run by the York Archaeological Trust, a charity that charges for its museums –though you are welcome to look around its shop, just inside the door to the museum. This museum’s displays are changed from time to time but are well presented and some of them are usually closely linked to the Walls. Going in also lets you explore some of the inside of the bar, though in this respect the museum is less impressive than Monk Bar –for example there are only parts of the portcullis left. so York may overlook the town of York”. “to see this sight, it irks my very soul. Withhold revenge, dear God! ’tis not my fault”. Henry was right to fear revenge: Richard of York had adult sons to claim his dukedom, to inherit his claim to kingship and to claim revenge. This was the struggle for the crown which the Victorian’s labelled “the Wars of the Roses” –because the Duke of York used a white rose as a badge and Shakespeare wrote a scene in a rose garden where lords plucked roses of red or white to show which side of the struggle they were going to support. Revenge came very quickly to Richard’s oldest son, Edward; the next year he won the Battle of Towton, just south of York, a battle often described as the bloodiest ever fought in England. 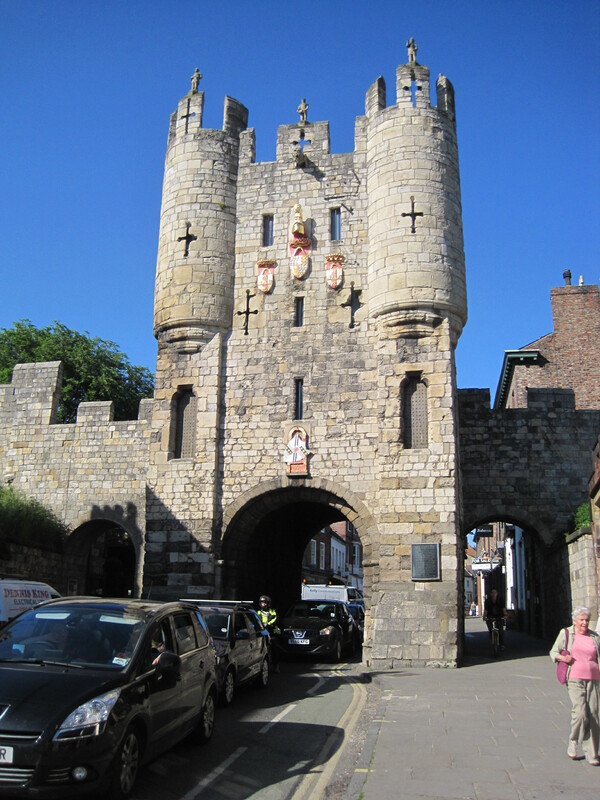 He came out of that battle accepted as King Edward IV, then he came to Micklegate Bar, where royalty are traditionally welcomed to the city. “The saddest spectacle that e’er I viewed”. 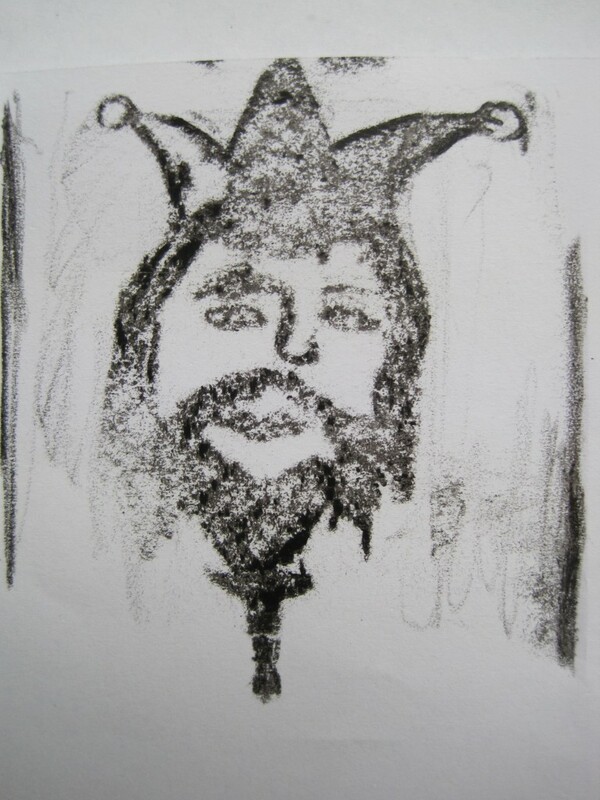 Edward had the head removed and replaced by heads from the Lancastrian, red rose, side of the struggle. The struggle did not fully end till Edward’s brother, Richard III, was killed in battle and the winner of the battle was crowned Henry VII, married Edward’s daughter in the Minster and took as a badge a red and white rose, the “Tudor rose”. 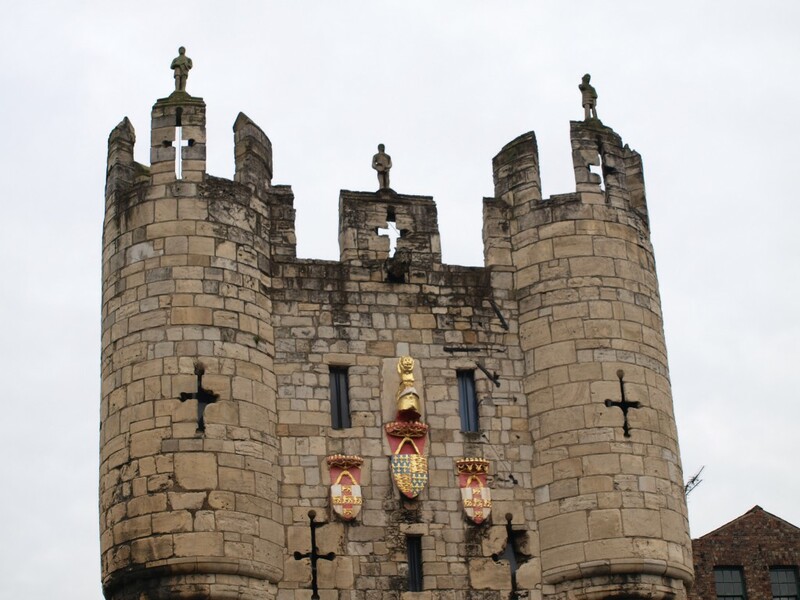 This end explains the greeting Henry VII got at Micklegate Bar: the pageant performed there had heaven pictured at the top of the bar and a crown descending from heaven onto a white and red rose while other flowers bowed at the bottom of the bar.